Peonies are drooping darlings with huge flower heads and arching stems. They often need help standing upright, somewhat like Happy Hour retirees. This nodding behavior may be due to the big blooms, but it could also indicate the plant needs water. Do you know how much to water peonies? 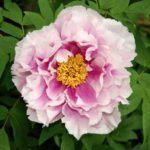 If not, continue reading for tips on optimum peony irrigation. The large, brightly toned flowers of peonies are unmistakable. Peonies grow in a variety of soils, but the one thing that can cause root rot is boggy, ill draining soil. This doesn’t mean peonies don’t need water. On the contrary, these perennial beauties need to be kept moist the first year, and mature plants need supplemental water frequently. 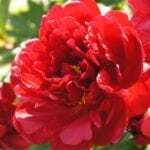 Peony water needs depend upon your region but some commonsense info on how to tell when it’s time will keep your plants happy. The peony is native to Europe, Asia and western North America. They grow from thick storage roots that can be divided to create new plants. These roots do not dive deeply into soil. Instead, they are thick branching without many surface roots. Their very structure means they cannot gather moisture from deep in soil nor can they easily harvest dew and lighter moisture at the surface. Peonies are drought tolerant for short periods after establishment but best growth and healthier roots stem from consistent watering. On average, plants need 1 inch (2.5 cm.) of water per week. The simplest way to test peony water needs is to touch the soil. Touching the top is probably sufficient in a hot summer but in spring and fall, you should actually insert a finger. If soil is dry to the second knuckle, the plant needs water. Visual cues will be wilting, dropping buds and discolored, dried foliage. There are soil moisture testers you can purchase if you have trouble telling when it’s time for watering peonies. A good rule of thumb is to deeply water every 10 to 14 days for mature plants. Young plants that are just starting should get nearly twice as much water. Avoid watering peonies overhead. The moisture on the leaves can encourage the formation of powdery mildew and other fungal diseases. If you must water on top of the foliage, do so when the plant has time to dry before night. A drip line makes an excellent source of peony irrigation and can even be set to a timer to deliver just enough moisture at exact intervals. Consider using an organic mulch around peonies. This will not only conserve moisture but also prevent many weeds and gradually compost into the soil, releasing needed nutrients. Peonies are unforgettable flowers that have old time elegance combined with modern day pizzazz. Provide them the proper amount of water, food and sun and they will reward you for years with effortless beauty.